If life on earth started in the sea, it might explain why most of us consider food "unseasoned" without a little salt. It's one of our five (six) primary tastes and it's fundamental in the culinary world. Yet, not many cocktails embrace this flavor. Perhaps drinks are meant to be refreshing and thirst-quenching—a characteristic that is incongruous with salt. 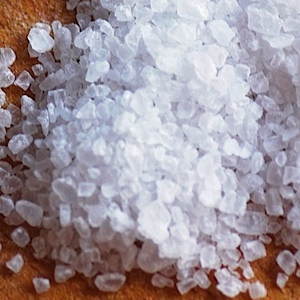 However, if added in small amounts, salt can enhance other flavors just like it does with food. Margarita fans recognize that salt tastes great with lime and tequila. Also, some muddled ingredients such as cucumber will benefit by adding a scant pinch beforehand. But generally speaking, salt is largely ignored in cocktails with only a few exceptions here and there that incorporate it nicely. 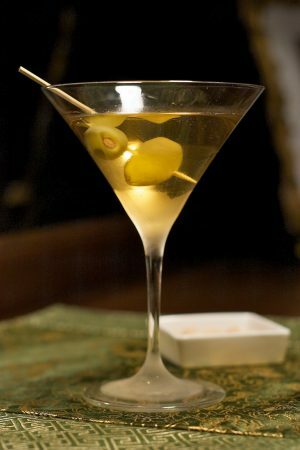 When it is used, it's often crystals on the rim of the glass or sprinkles upon a drink's surface as a garnish. But what if you want to incorporate salt flavor into a cold beverage throughout? How much do you add? Is a pinch going to be consistent from drink to drink? Do you spoon it in before shaking? Will it dissolve? What kind of salt should you use? Recently, my wife and I enjoyed a few drinks served by Johnny Michaels in the Lounge at La Belle Vie. Some of the drinks there are legendary. In addition to being one of the most creative bartenders in the Twin Cities, Mr. Michaels is an exception when it comes to using salt. During our visit we tried several cocktails that by chance, featured salt as a minor ingredient. One of the most popular is the Night Of The Hunter. This incredible drink is described as "vodka with a hint of salty caramel", but it's impossible to recreate the magic armed with that description alone—trust me, I've tried. A while back, I set out to recreate Night Of The Hunter, but that was before knowing the ingredients. I knew it was a vodka drink with salt, and that it tasted like caramel, so my first attempt at this was to make caramel-infused vodka. This seemed easy enough—simply drop a few caramel candies into a bottle of vodka. After just a few hours, they dissolve and you are left with a milky infusion. It may have tasted like caramel, but it looked awful. The real cocktail has a golden hue that remains clear like a gemstone. How does he do that? I chalked this up as a failed attempt that looked terrible in the glass but really cool as it swirled down the drain. When I eventually had the chance to talk to him about it, Michaels explained his caramel secret—it's not caramel at all, and it's not an infusion. He combines Oloroso sherry with Licor 43 (a vanilla-forward, tangy, spiced-fruit liqueur), and then adds a dash of saltwater. Sherry is a fortified Spanish wine and Oloroso is a style that is sweet and aged, often imparting a bit of caramel flavor. Combined with Licor 43 and saltwater, the result is an illusion for your senses. It smells like caramel and tastes like buttery brown sugar candy with maybe an odd hint of dry vermouth. This incredible combination gave me renewed hope and the promise of finally making this drink at home. But first, I needed to work out the salt. I figured I could mix up a saline solution and add it drop by drop like bitters until it was just right, so long as the concentration was high enough. Making it was easy, but describing the concentration is confusing. Saline solutions are often described in percentages or parts-per-million. Then there are weight-volume measurements and even examples that rely on total saturation at a given temperature. You have chemistry terms like molarity and normalization and the confusion goes on and on. I decided to ignore all of the technical nonsense and picked an arbitrary starting point of one (1) tablespoon of kosher salt dissolved in two (2) ounces of water. Like making a simple syrup, this is analogous to a 1:4 ratio of salt to water by volume, although once dissolved, the salt doesn't appreciably increase your amount of liquid. I later read that the maximum saturation I could probably achieve at room temperature is around 1:3, so my saltwater is pretty strong. Seawater is much lower at round 3%—however that translates. Equipped with an eyedropper of concentrated saltwater, I set out to test the quantities of the other ingredients. Stir with ice, strain into chilled cocktail glass. Garnish with marcona-stuffed olives. To make the saltwater, dissolve 1 tablespoon of sea salt in 2 ounces of water. After a bit of experimentation, I came up with this version. It looks authentic, it tastes incredible, and it was fun to try to figure it out. It's important to recognize that this is my approximation of the recipe based on memory (and confirmed by my wife). It also relies on my saltwater solution, but Johnny Michaels probably has his own way of doing it. We probably use different brands of sherry too—I only invested about $15 in the bottle. The garnish is green olives that you need to stuff with marcona almonds. If you don't know these, marcona almonds are fantastic. If you leave them on the table for guests, they will be gone before you can mix up another one of these drinks. Use bigger olives to accommodate the nut, and depending on the olive brine, you may need to tweak the amount of saltwater. I actually don't like olives, so I garnish with just a couple of the almonds. Making this amazing drink demonstrates the usefulness of salt. You can easily ruin a drink with too much, but this experience has me wondering how else I might be able to incorporate it into other cocktails. Accuracy is important, so if you don't have an eye dropper, use your bar spoon. I measured about 110 drops of saltwater to a quarter-ounce. So, for this drink, that puts 30 drops at about one-twelfth (1/12) of an ounce or less which is pretty hard to measure with a jigger. It's darn close to half a teaspoon, but bar spoons vary. Start with a little in the bottom of your spoon, stir it in and taste it, adding more if necessary. I can easily taste the difference between 20 and 30 drops, so proceed with caution and you will know for next time. Chances are, you'll make more than one of these! Do you know any cocktail recipes that use salt? Let me know in the comments below. Since posting this, there have been a few other recipes on Summit Sips that use salt. The Edgewood and the Oliveto are two. There may be others. Click "salt" in the list of tags at the bottom of the post.